The first half of the international season concluded last weekend in Barcelona, Spain with the ISU Grand Prix Final, which featured the top qualifiers from the six Grand Prix events throughout the season in each discipline. The event featured head-to-head matchups between many of the top skaters so far this season and provided an early preview of the 2016 World Championships in Boston. In addition, the ISU Junior Grand Prix Final was held the same week in Barcelona and crowned champions at the junior level, including two from the USA. The night, the competition, and the Grand Prix season belonged to Japan’s Yuzuru Hanyu, who shattered his three previous world record scores set at 2015 NHK Trophy by totaling a 330.43 in Barcelona, 110.95 in short program and 219.48 in the free skate, easily winning both segments. His monumental victory included landing five quadruple jumps cleanly: two in his short program and three in his free skate. Coming in second was his training mate from Spain, Javier Fernandez, who electrified his home crowd with his energetic “Guys and Dolls” free skate. His competition total was 292.95, which on any other night and against any other skater might have been enough for the gold medal, but Hanyu was simply untouchable. Japan’s Shoma Uno, who won the Junior Grand Prix Final men’s title in Barcelona one year ago, finished in third place with a powerful rendition of his “Nessun Dorma” free skate and a total score of 276.79 while Canada’s Patrick Chan finished just off the podium in fourth place after battling back in the wake of a disappointing short program to end with a total score of 263.45. China’s Boyang Jin had the same total score of 263.45 but placed fifth due to finishing below Chan in the free skate. Jin attempted four quadruple jumps, one of which was his now trademark quadruple Lutz. Japan’s Daisuke Murakami who rounded out the field in sixth place with a score of 235.49. In the junior men’s competition, Nathan Chen won the gold medal in his second trip to the Final and became the first U.S. man to win the title since Jason Brown in 2011. Russia’s Dmitri Aliev and Japan’s Sota Yamamoto won silver and bronze, respectively. USA’s Vincent Zhou placed third in the free skate, finishing fourth overall in his first ISU Junior Grand Prix Final. Much in the same way that Hanyu locked down the men’s event, Russia’s Evgenia Medvedeva, who won the ISU Junior Grand Prix Final title here last year, left no doubt as to who would be taking home the gold medal in the ladies event. The only blemish on her protocol was an unclear edge on her solo triple Lutz in her free skate, but beyond that she was on fire, landing triple after triple with ease. She will head into Russian Nationals as the favorite after her emphatic performance in Barcelona in which she accumulated 222.54 points, almost 14 points more than Satoko Miyahara of Japan who finished in second place. Miyahara, a skater with maturity beyond her 17 years and expression beyond her small 4 foot 10 inch frame, again left the crowd breathless after her beautiful free skate. She moved up from fourth place after the short program to win the silver medal with a total score of 208.85. Following her in the standings was Medvedeva’s countrywoman Elena Radionova, who finished fourth in the free skate but was able to secure the bronze medal by virtue of her second place score in the short program. Her total competition score was 201.13, just ahead of USA’s Ashley Wagner who set a new ISU personal best free skate score of 139.77, highest-ever for a U.S. lady, to move up into fourth place with a total score of 199.81. USA’s Gracie Gold and Japan’s Mao Asada finished in fifth and sixth place, respectively, with totals of 194.79 and 194.32. In another runaway finish, Russia’s Ksenia Stolbova and Fedor Klimov took down reigning World Champions Meagan Duhamel and Eric Radford with an incredible performance to give them confidence going into Russian Nationals and the European Championships. Helped by their new triple toeloop-triple toeloop-double toeloop combination, the Russian pair accumulated a total competition score of 229.44, with their free skate score just .06 away from the world record held by their teammates and 2014 Olympic champions Tatiana Volosozhar and Maxim Trankov. Though Duhamel and Radford still skated well, it just wasn’t enough to come close to beating Stolbova and Klimov. The Canadian pair totaled 216.67 overall and finished in second place, ahead of Russia’s Yuko Kavaguti and Alexander Smirnov who, despite some technical troubles at the beginning of their free skate, battled to total score of 206.59 to take home the bronze medal. Last year’s ISU Junior Grand Prix Final pair champions, Canada’s Julianne Seguin and Charlie Bilodeau, made another powerful impression in Barcelona, putting together a total competition score of 200.98 to finish just off the podium. They will go head-to-head again against Duhamel and Radford at the Canadian National Championships. China’s two teams of Xiaoyu Yu and Yang Jin and Cheng Peng and Hao Zhang finished in fourth and fifth, respectively, with scores of 186.87 and 183.04. In spite of USA’s Alexa Scimeca and Chris Knierim‘s seventh place finish with a score of 177.42, it was a positive step forward for an American pair team to qualify for the ISU Grand Prix Final for the first time in eight years. The increasing depth and quality of American pairs will be showcased at the upcoming National Championships in Saint Paul, Minnesota. Team USA collected three medals in Barcelona in their deepest discipline, highlighted by a second consecutive silver by Madison Chock and Evan Bates. Canada’s Kaitlyn Weaver and Andrew Poje won the gold for the second straight year and the bronze went to Italy’s Anna Cappellini and Luca Lanotte. This was the first time in history that three senior level dance teams from the same country, United States of America, qualified for the Final. Maia and Alex Shibutani and Madison Hubbell and Zachary Donohue finished fourth and sixth, respectively. Two Wheaton, Maryland-based teams, Lorraine McNamara and Quinn Carpenter and the siblings Rachel and Michael Parsons, won Junior gold and bronze, respectively. 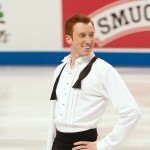 For more coverage of the ice dance event, please visit ice-dance.com.